Karlsson et al. 2005), and fluctuations in quantity and quality can strongly affect microbial metabolism and community structure (Bott et al. 1984, Judd et al. 2006). All DOM originates as natural biological products. Some derives from instream processes described previously, including leachate from leaves and other POM, and by extracellular release from algae and higher plants. 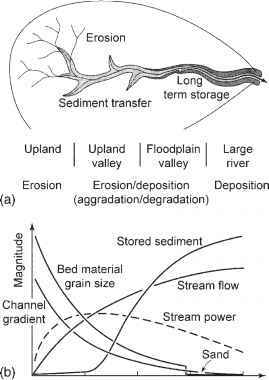 In addition, soil and groundwater are major pathways of DOM transport from terrestrial vegetation and wetlands into river water. While the size of the DOM pool indicates its potential importance to heterotrophic energy pathways, much of this material is highly refractory and thus of low bioavailability on timescales relevant to stream transport. However, river water also contains labile DOM, and this material constitutes a potentially important energy source for microbial production and possibly for higher consumers as well. DOM includes a variety of organic compounds that are potential C sources for microorganisms, and for this reason and because many studies now rely on automated C analysis by combustion of water samples, it often is reported as DOC. For all practical purposes these terms can be interconverted by assuming that DOM is 45-50% organic C by mass. Organic forms of N and phosphorous can be quantitatively significant fractions of DOM, and potentially are available for uptake by algae and heterotrophs. Thurman (1985), however, the colloidal fraction typically is <10%. From 10% to 25% of DOM consists of identifiable molecules of known structure: carbohydrates and fatty, amino, and hydroxy acids. The remainder (50-75%, up to 90% in colored waters) can be placed in general categories such as humic and fulvic acids, and hydrophilic acids. Humic acids separate from fulvic acids by precipitating at a pH < 2 while fulvic acids remain in solution. Fulvic acids are also smaller than humic acids, which often form colloidal aggregates of high molecular weight (HMW) and may be associated with clays or oxides of iron and aluminum. Fulvic acids generally are the majority of humic substances (Thurman 1985). In the Amazon, for example, fulvic acids were approximately 50% and humic acids 10% of riverine DOC (Ertel et al. 1986). Primary producers can be important sources of DOM in streams and rivers, releasing mainly low molecular weight (LMW) and labile matter as exudates and from cell lysis (Bott et al. 1984, Bertilsson and Jones 2003). This organic C source may be most available during episodes of high primary production when exudates are produced, and within surface biofilms where exudates and products of cell lysis become concentrated. During springtime periphyton blooms, stream DOC concentrations have been noted to increase as much as 37% from a predawn minimum to a late afternoon maximum, apparently due to extracellular release by algae (Kaplan and Bott 1989). Leachate from leaf litter and other POM including fish carcasses is a high quality source of DOM that may be seasonally pulsed, as occurs with autumn leaf fall into woodland streams. Some 42% of the autumnal DOC inputs to a small New England stream were attributed to this source (McDowell and Fisher 1976). Exclusion of leaf litter inputs to a stream at the Coweeta Hydrological Laboratory resulted in lower DOC concentrations than in a nearby, untreated reference stream (Meyer et al. 1998). Instream generation of DOC from leaf litter was estimated to contribute approximately 30% of daily DOC exports, and to be greatest in autumn and winter and during periods of increasing discharge rather than at baseflow. DOC concentrations were higher during the fall and early winter in a deciduous woodland stream in Tennessee (Mulholland 2003). Soil OM originating in aboveground and be-lowground terrestrial production is a quantitatively important source of DOC to fluvial ecosystems. Grasslands contain the highest soil OM, deserts the least, and forests are intermediate. The interstitial water of soils usually contains high DOC concentrations, in the range of 2-30 mg L_1, due to solubilization of organic litter (Thurman 1985). Most soil DOC is produced in the organic horizon and from leaf litter and root exudate and decay. Enzymes released by soil microorganisms also contribute to the soil DOC pool (Aitkenhead-Peterson et al. 2003). DOC that reaches stream channels by surface and shallow subsurface flowpaths is of higher quality and concentration than groundwater DOC, where low concentrations are a consequence of biological and chemical degradation of OM and of physical adsorption. Mineral soils can also adsorb organic molecules, and an increase in the content of clay, aluminum, and iron oxides is usually accompanied by higher adsorption of DOC (Aitkenhead-Peterson et al. 2003). Median values for groundwater DOC are usually <1-2mg L 1 (Thurman 1985), whereas the DOC in shallow soil water can be considerably higher. In small streams in North Carolina, Meyer and Tate (1983) recorded DOC concentrations of 2-12 mg L 1 in soil water in contact with the active root zone, compared to 0.2-0.7mg L 1 in subsurface seeps. Similarly, in the catchment of an Alberta stream, the median DOC concentration in soil interstitial waters was 7 (range 3-35) mg L_1, whereas shallow groundwater in the saturated zone contained 3mgL 1 DOC (Wallis et al. 1981). DOC of terrestrial origin is rich in aromatic components such as lignin and tannins because these compounds are abundant in terrestrial vegetation (Benner 2003), and as we shall see these compounds are less accessible to microorganisms. Precipitation is a highly variable source of DOC, influenced by contact with dust and pollen (Aitkenhead-Peterson et al. 2003). When rain water is intercepted by leaves of the forest canopy, leaching removes significant amounts of OM. Fisher and Likens (1973) estimated an average value of 17.8mg L 1 for canopy drip in a hardwood forest in New England. Precipitation indirectly affects riverine DOM through its influence over soil moisture and hydrologic flowpaths. Water that moves near the soil surface has greater contact with the organic horizon of soils, resulting in higher DOC concentrations (Mulholland 2003). Flowpaths also influence the temporal response of DOC concentrations to increases in rainfall. In well-drained soils, an increase in streamwater DOC during a storm is expected due to shallow subsurface flowpaths and flushing of soil DOC. In contrast, in streams draining wetlands, surface flow is dominant and increased rainfall may produce a decrease in DOC concentrations as a dilution effect (Mulholland 2003).